Located in Kyoto Station, Musashi offers more than 50 kinds of sushi on a conveyor belt. What makes Musashi different from other chain sushi restaurants is that Musashi provides handmade sushi made by sushi chefs in a kitchen surrounded by the conveyor belt. Carefully chosen fish, seaweed and wasabi are used for sushi. What is great about Musashi, other than the taste and the quality of sushi, is that you can taste them at a reasonable price. 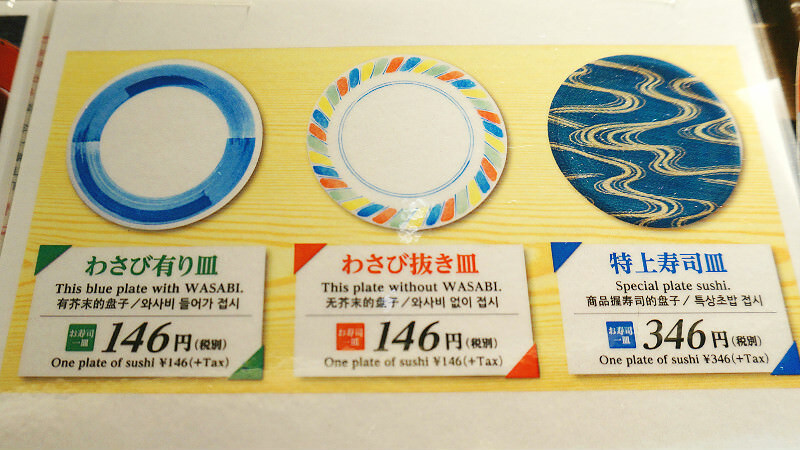 If you would like to experience the conveyor belt sushi in Kyoto Station, we highly recommend that you visit Musashi! If you are not familiar with “Yuba”, it is tofu skin made from gently boiled soy milk. It is unique as a sushi topping, but it tastes surprisingly good. You may notice the chewy texture and well it goes with vinegared rice. Please put a little bit of soy sauce as it matches well with the grated fresh ginger. There are three names for the fatty parts of tuna: toro, chutoro, and otoro, toro being the least fatty and otoro being the fattiest. The tuna in the picture is otoro, and the tuna just melts in your mouth. This is a sushi roll with pork cutlet inside. The pork cutlet is well fried and sweet sauce and lettuce are put inside of the sushi roll. If you would like to try some western-style sushi, this is the one! If you would like to taste sushi in your hotel, you can also purchase the sushi box here. There are various kinds of selections such as sushi rolls with different sorts of fish and vegetables, and Kyoto’s special sushi called “Oshizushi”. All of them are very fresh and tasty, so please feel free to make a purchase here! English, Chinese and Korean menus are available. If you want to have hot Japanese tea, please take one of the cups in front of your table and put a tea bag in it. Hot water faucet is set just in front of you. I surely enjoyed the fresh sushi in this restaurant! My personal favorite is “Yuba sushi” as I enjoyed the chewy texture of tofu skin. Please enjoy the taste of ginger with it! You can have fun looking at the sushi conveyor belt with sushi plates on it. I also suggest that you try the takeout sushi in front of the restaurant. 10 a.m. - 10:30 p.m. (Last orders at 10:15 p.m.) *Takeout sushi is available from 9 a.m.